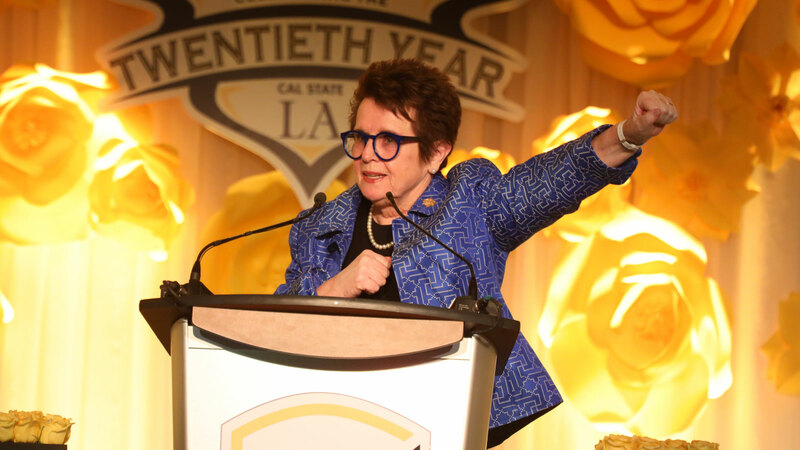 For two decades the Billie Jean King & Friends Gala has supported hundreds of student-athletes and honored dozens of exemplary humanitarians, including journalist and activist Maria Shriver, Olympians John Carlos and Tommie Smith, and philanthropist George L. Pla. 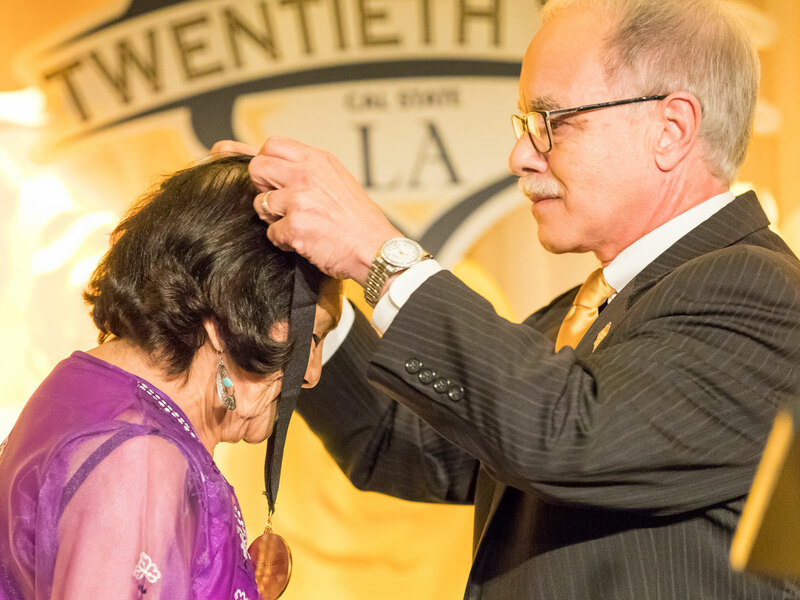 The tradition continued at the gala’s 20th anniversary, as civil rights legend Dolores Huerta was awarded the California State University, Los Angeles Presidential Medallion. 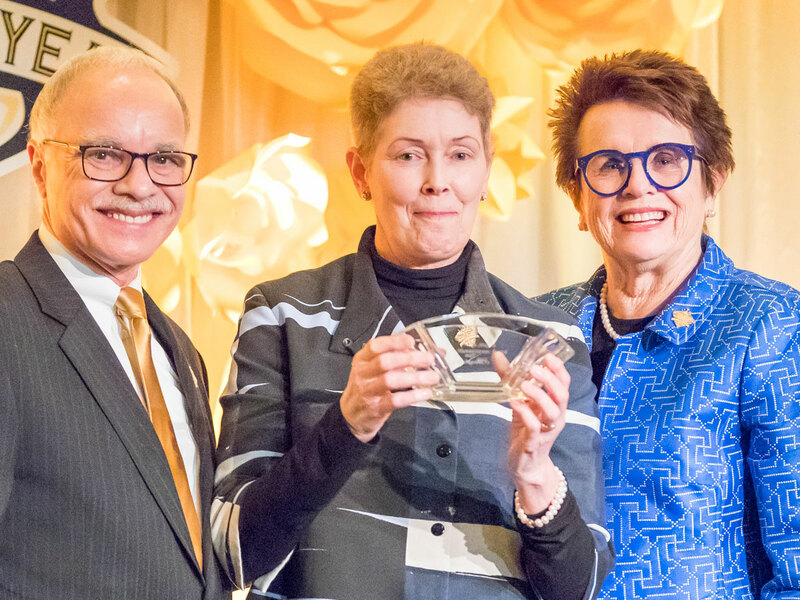 STEM education champion Tam O’Shaughnessy, Ph.D., received the Joe Shapiro Humanitarian Award. King was referring to a groundbreaking study that ranked Cal State LA number one in the nation for propelling a higher percentage of students from the bottom fifth of income into the top fifth of U.S. earners. A world champion athlete and global advocate for social justice, King won her first Wimbledon title in women’s doubles while she was a player on the Cal State LA women’s tennis team. Years later, as 50 million viewers watched on television, King scored a monumental victory for women’s equality when she defeated Bobby Riggs in the “Battle of the Sexes.” That epic match is now the subject of a feature film of the same title starring Emma Stone. 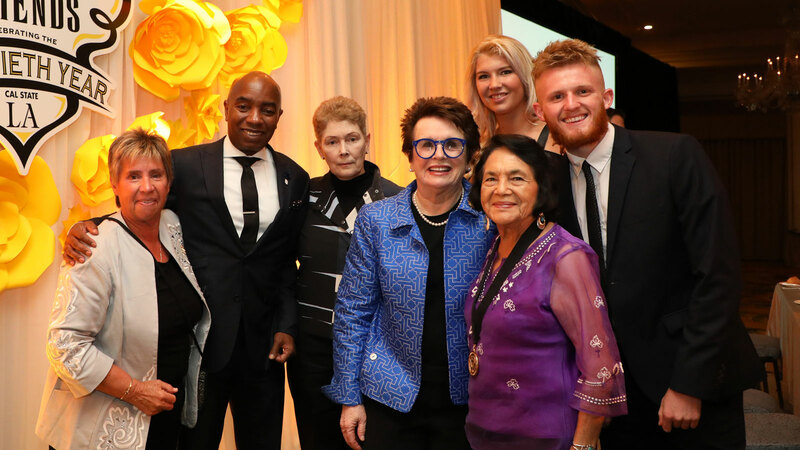 Fellow tennis great Rosie Casals, who was also depicted in the film, joined King at the gala and has been involved with the event since its inception. O’Shaughnessy, the Joe Shapiro Humanitarian Award recipient, is the co-founder and executive director of Sally Ride Science at UC San Diego. O’Shaughnessy grew up in California and played professional tennis from 1971 to 1974. She has dedicated much of her career to promoting young people’s interest and women’s representation in STEM, or science, technology, engineering and math. She has authored 13 children’s books, helping to promote science literacy among youth. O’Shaughnessy was the life partner of the late Sally Ride, the nation’s first woman in space. Tennis Hall of Famer Pam Shriver served as the emcee. Her late husband is the namesake of the Joe Shapiro Humanitarian Award. Shapiro was known for working enthusiastically to help student-athletes reach their educational and athletic goals. 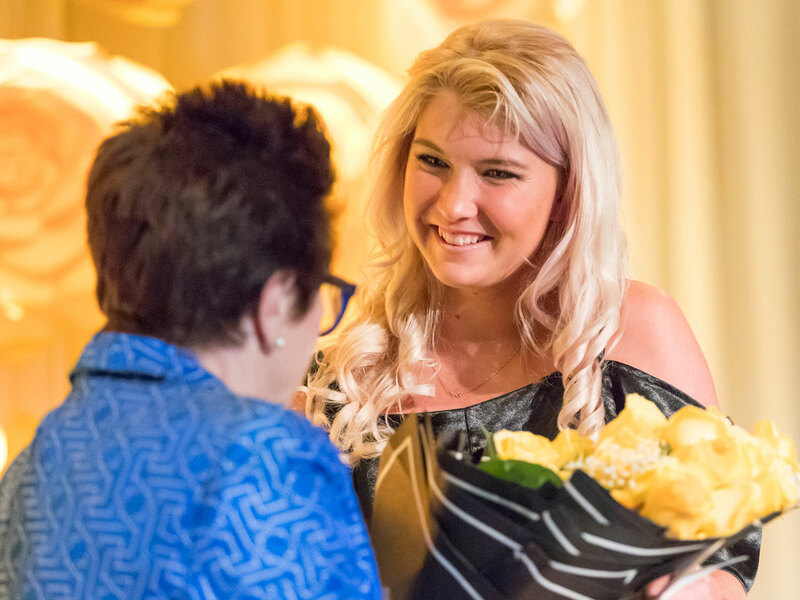 “This award actually means a lot to me, and I am very proud to be standing here in front of you,” O’Shaughnessy said as she accepted the award. Cal State LA President William A. Covino presented Huerta with a California State University, Los Angeles Presidential Medallion, the University’s highest honor. Huerta, co-founder of the United Farm Workers labor union, started her activism in high school and embarked on a lifelong crusade to fight economic injustice and advocate for the working poor, women and children. Huerta expressed her appreciation to Cal State LA and King for providing athletic opportunities to women and young people of color. 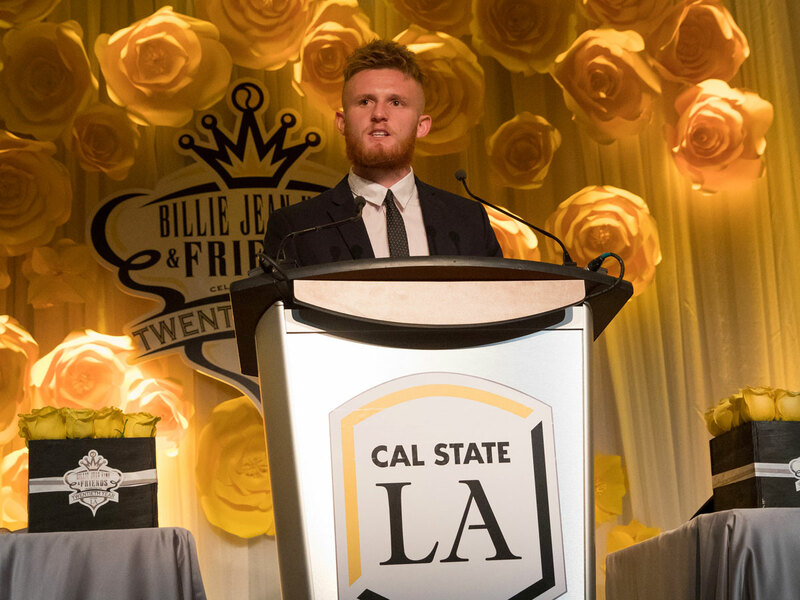 Golden Eagles soccer player Sam Croucher, a student pursuing a Master of Business Administration, received the Billie Jean King Scholarship. Croucher was named to the CCAA Championships All-Tournament team and earned a CCAA All-Academic Award for the second straight year last season. Computer science major Elizaveta Sokolova received the Joe Shapiro Scholarship. Sokolova earned an Intercollegiate Tennis Association Scholar-Athlete Award and Academic All-PacWest Conference recognition for a third time. Covino thanked King for her unwavering support of student-athletes.